A more condensed version of this article first appeared on the Constant Contact blog on November 21, 2016. Thanksgiving is a distant memory and Christmas is almost here! That is enough reason to start putting up Christmas decorations and start drinking eggnog. No? Well, it is certainly time for brands to get started on their holiday campaigns. Holiday campaigns are crucial for most brands. The percentage of sales that happen during this season legitimizes considerable ad spend. The flipside is, with the abundance of brand content during this season, standing out gets more difficult. This calls for innovative campaigns that resonate with your audiences. 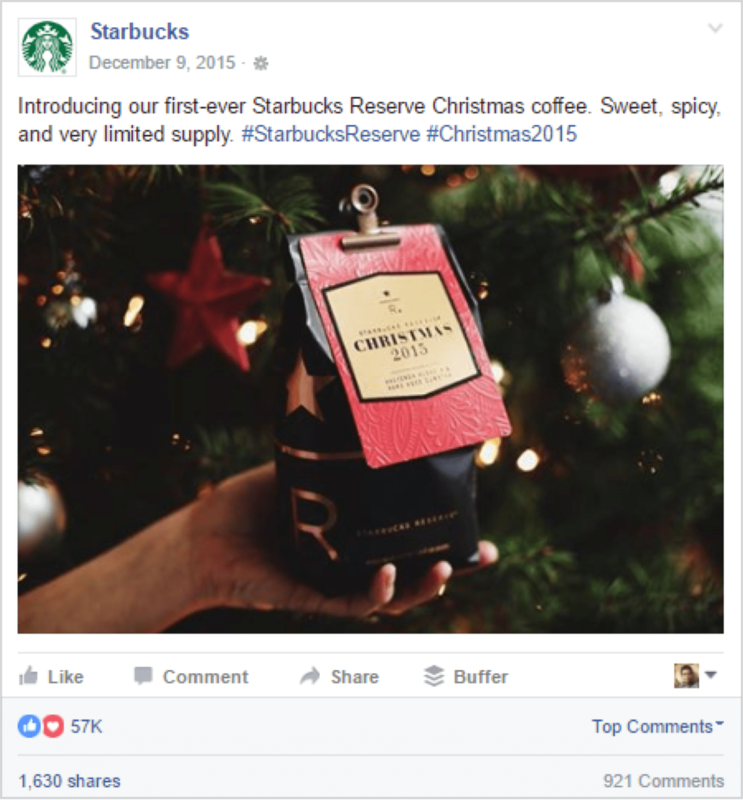 Here, I take a look at some of the most engaging pieces of content published by brands on social media around Christmas. These are wonderful sources of inspiration to power your holiday campaign. I also discuss how you can use data to ensure that your holiday content gets the engagement it deserves. Once you arrange the 150,000 odd brand Tweets and Posts published around Christmas in the order of engagement, you will notice some patterns in the content that gained traction. These insights will ensure that your best talents go into creating the most effective holiday campaign. Let’s take a look at some of the most popular types of holiday content and identify the elements that make them so engaging. This was greeted enthusiastically with over 57,000 Reactions, and close to 1,000 Shares. Holiday themed products are a great way for your brand to embrace the holiday spirit. If you plan to do this, make sure to publicize it widely. Featuring this in your social media and email campaigns can do the trick. The key is to use alluring images and persuasive copy. Chick-Fil-A took a more innovative route to joining in the festivities. Because, how can you think about anything that doesn’t have some fried chicken in it? Social media holiday campaigns have become all the rage recently. In the past few days, I saw a couple of amazing video advertisements published by Sainsbury’s and Marks and Spencers. Within the span of 3 days, the M&S video has amassed engagement in the order of 108,000 Reactions, 98,000 Shares, 12,000 Comments and 5.9 million views on Facebook. With nearly 50,000 Likes and Retweets, this touching video was one of the best performing Tweets from Christmas 2015. The retail brand emphasized the spirit of giving. By underlining the joy of receiving a gift and feeling cared for, John Lewis masterfully left a lasting impression on their audiences. The consumer electronics brand roped in Tracy Morgan to star in this hilarious ad. With over 2 million views, 38,000 Reactions and 13,000 Shares, this ad won big. Tapping into the huge fan following actors and sportspersons enjoy is a surefire way to get more eyeballs on your content. As engaging as these types of content are, they incur considerable expenditure. As I mentioned in the beginning, the sales generated during this season are spectacular. This legitimizes ad spend that exceeds the usual limits. The only thing that brands have to ensure is that there is a clear call to action in these messages. The video should communicate your product in every possible way. For instance, in the John Lewis ad, the retail brand reinforces the message that they should show their loved ones that they care, with the perfect gift from their store. In addition to that, look at the channels that give you the most traction. Within social media networks, your brand might get more engagement on say Instagram, as compared to Twitter and Facebook. Do your email marketing efforts experience respectable open rates and click-throughs? Consider the Reach you get on these different platforms and the achievement of your marketing goals. By answering these questions, you can focus your efforts on marketing initiatives that work out the best for your brand. The holiday season cannot be complete without sales, contests and mega discounts on every store. Sure, everyone loves a good sale. But how will your brand stand out? By doing so, Too Faced demands audience attention and routes it to their Christmas collection. Note that this video was published in September. This technique works in getting the audience excited in advance. Bath and Body Works placed their products center stage. In addition to the festive Christmas themed products, they announced an attractive offer. They hit the nail on the head with a subtle suggestion that these make perfect gifts. These go a long way in keeping your audiences hooked for a longer period. The amazing thing about giveaways and contests is that it gets a lot of engagement. This boosts the reach that your brand content receives. This Post advertises a DIY workshop that Home Depot will be conducting a couple of days. Announcing live videos beforehand helps brands get more views. With Buzzfeed Tasty taking over the internet, recipes for holiday treats are guaranteed to pull in great engagement. Rum Chata and Tesco published some splendid content along the same lines. Biltmore put up a video of the tree raising ceremony on Facebook. This video brought in more than 100,000 views, 6,000 Reactions and 4,000 Shares. Using the live video feature on Facebook can be particularly effective here. Several brands celebrated the spirit of giving with charitable activities. These contribute to the brand’s goodwill. They encourage audiences to take part in these initiatives. Macy’s partnered with Make-A-Wish America to help fulfil the wishes of kids who suffer from life-threatening diseases. If you take a look at some of the comments on this Post, you will see that an overwhelming majority of users share their experiences. These kinds of content builds a sense of community and brand loyalty. Walmart too did a similar campaign calledFill the Truck. Great marketing efforts, like the ones we have discussed so far, excel by working the brand into a larger conversation that has your audience’s attention. With overpopulated conversations like Christmas, you should adopt relevance as your guiding principle. Before chalking out a marketing strategy around the holiday season,ask yourself what your brand plans on getting out of it. Are you looking to get more people to visit your website or store? Or do want to draw their attention to a particular event that you will be conducting? Once you have this goal set, you can streamline your marketing strategy to serve this goal. If, for instance, you want to increase footfall to your store, advertising attractive discounts will be the way to go. Once you have decided on the content types that will service your goals best, use data to inform the execution. Measure, measure, measure. That is the only way your brand can achieve the holiday marketing goals you have set for your brand. Start by taking a hard look at your performance during the last holiday season. Identify strengths and weaknesses in your content. You can look at the email subject lines that got you the most open rates, the Call To Action copy that got the most clicks, the Tweet type that received the most engagement. Compare this to how your peers have performed. This will give you a good idea of where you stand, and the room for improvement. With this evaluation of your brand content, look for ways to take this up a notch. Using content discovery tools, you can use data to see the kind of content that has been well-received in the past. You should also search for recent trends too, so that you don’t end up singing the same song. Once you have used these insights to come up with a solid content strategy, use data (again) to see how this can be executed efficiently. Take a look at whether timing of content has an impact on the engagement that they receive. How frequently should you send emails, Tweet and Post? Did all that? Well, there’s still a bit left to do. Keep monitoring your current performance to check if alterations are to be made. Maybe you found that video content got most engagement last year, yet the GIFs you’ve published this year are performing better than your videos. Then, it would make sense to circulate more GIFs, and promote a few of those. Sharing your brand logo with a snowflake and a candy cane in the background, with a run-of-the-mill holiday greeting might earn you Likes. But, if you aim at getting concrete gains from your online marketing efforts, find a niche where your product fits. The content you create should resonate with your audience. As a brand with an online presence, you already have a clear idea of who your audience is. You also have a clear idea of the specific solution your brand provides to your consumers. To get through to your customers this holiday season, you can adopt any of the content types we discussed earlier. Your message should communicate to your audience what your brand is all about. Holidays come with as much stress as joy. Target these pain points. Discover‘s treasure trove of brand content can get you in the festive mood. Let’s make this Christmas extra merry!